The electronic highway is akin to the early network of roads in the US: exciting changes happen daily but there’s still lots of work that needs done; you can guess that I’ve had some computer problems lately! To get back on track, click on Southwest Iowa News for an interesting article on recent renovations at Harrison County Museum/Welcome Center in western Iowa. 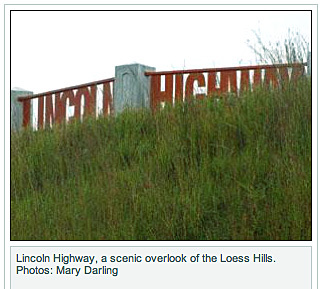 A description of what you’ll find at the center follows this image of the Loess Hills overlook. Phase I of the project included the Lincoln Highway surface demonstration – showing how the surface of the Lincoln Highway changed from dirt to gravel, to brick etc. It includes bricks from the streets of Missouri Valley that had been stored at the museum prior to the tornado that hit in 1999 and were saved for future use. Also included in the expansion are Lincoln Highway interpretive panels, an auditorium showing films on the Loess Hills and Lincoln Highway, a children’s transportation play scape next to a cabin court picnic area, a scenic overlook observation platform, among other signage. The New-York Historical Society will open an exhibition, Lincoln and New York, on October 9, 2009. New York of course lays claim to the Eastern Terminus and a few blocks of the cross-country Lincoln Highway. The exhibition will trace the relationship between the man and the city; it will run through March 25, 2010. The photo above showing Lincoln’s funeral procession also reportedly caught young Teddy Roosevelt at the window of his grandfather Cornelius Roosevelt’s house (the large house on the left). He and his brother Elliot are said to be the boys looking out the second floor window. The house sat on Broadway between 13th and 14th streets; it was replaced by the Roosevelt Building in 1894. The New-York Historical Society is located at 170 Central Park West between 76th & 77th streets. For more information, visit www.nyhistory.org or call (212) 873-3400. A new mailer/flyer details plans for the museum building being planned by the Lincoln Highway Heritage Corridor in western Pennsylvania. The Lincoln Highway Experience will be the largest and most prominent site documenting the Lincoln Highway. 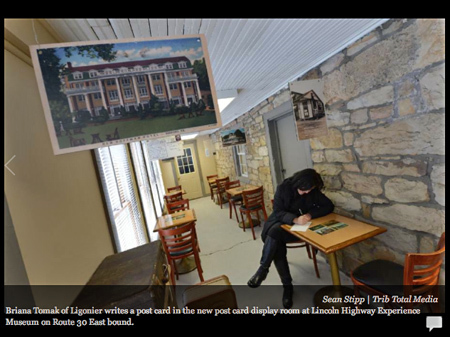 To be located just west of Ligonier, Pa., the Lincoln Highway Experience will tell the story of the highway both in the state and on a national level. Interpretive exhibits will focus on the years 1912-1940 but the emphasis will be on what is still along the corridor, encouraging visitors to get out and drive the road. The building itself was designed by Venturi Scott Brown Associates, familiar to roadside fans for their pioneering work, including publication of Learning From Las Vegas: The Forgotten Symbolism of Architectural Form (1972, revised 1977) by Robert Venturi, Denise Scott Brown, and Steven Izenour. The 10,000 s.f interior was handled by Maude Group and Kissiloff Associates and will include two films. The LHHC has helped secure and administer grants for dozens of regional projects and is now launching its own capital campaign for the Experience. Donors at the $2,500 level will bceome members of The Lincoln Circle, with naming opportunities. The LHHC was designated in 1995 to promote economic development through tourism. Visit www.lhhc.org for more information about the Corridor. There were photos all around, including some of me on one of their Piaggio cycles. I’m not sure I could trade 4 wheels for a cycle, even one with 3 wheels, but it would certainly offer a more intimate experience with the roadscape. We swapped LH stories and then it was off to lunch. Here’s a very short video clip of them riding away from town on Smallman Street. The History Center is at the eastern edge of Pittsburgh’s downtown and at the western edge of the Strip District, named becasue it’s a thin strip of land along the river. It’s been home to mills and rails and workers and churches but in recent decades it’s known for prduce stands, and more recently, restaurants and nightclubs. Here’s Bob L getting a shot at Penn Mac, a great place to buy cheese, olives, and other Italian specialties. Then we headed to Enrico Biscotti. If there’s one thing photos and videos can’t do justice to, it’s the aroma of fresh-baked biscotti emerging from the oven. Lunch there is in a tiny alley that really feels like you’re in a European cafe. It was over all too soon for me since I had to return to work, but the 4 transcontinentalists were heading eastward in search of LH landmarks. I recommended the Abe Lincoln statue in Wilkinsburg and the tiny iron bridge in Turtle Creek in the shadow of the massive Westinghouse Bridge. 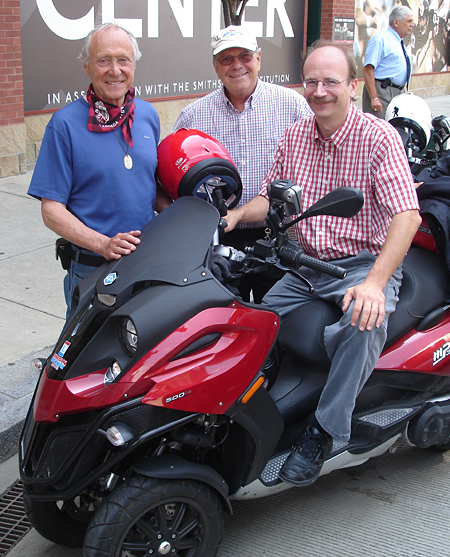 I loaned them my PA Lincoln Highway guide in hopes it would help them follow the route. And before we left, we got more photos: from left, Bob, Brian, Bob L, Buddy, and Rick. Read about their further adventures that day HERE. This month begins a three-year bicentennial celebration of President Lincoln’s birth, with many books and exhibits marking the occasion. In South Bend, Indiana, the Studebaker National Museum (201 S. Chapin Street), in cooperation with the Indiana Historical Society, is featuring The Faces of Lincoln through March 9. The exhibit is comprised of holdings from the Jack Smith and Daniel R. Weinberg Lincoln collections, along with Studebaker National Museum’s President Lincoln Carriage. The first section of the exhibit looks at the history of photography using some of the best and most well-known images of Lincoln. Part two investigates ways that photographers, printmakers, and cartoonists tried to influence opinion about Lincoln by altering his appearance. Section three challenges viewers to determine what kind of images and symbols the printmakers used to convey their, and the nation’s, feelings toward Lincoln. The Faces of Lincoln exhibit is based on the Indiana Historical Society’s extensive collection and initially traveled the state on the Indiana History Train in October 2004 and 2005. The Auburn Cord Duesenberg Automobile Museum, 25 miles north of Fort Wayne in Auburn, Indiana (off the Lincoln Highway but a popular diversion), will exhibit automotive bronze sculptures created by nationally acclaimed artist Alexander Buchan, and his grandchildren Alex, 11, and Adeline, 6, from March 14 through April 12. Buchan worked as Chief Design Sculptor at General Motors for 38 years. Above: This painted bronze sculpture by Alex Buchan (edition of 35) depicts a 1920 Indian motorcycle with a side car called the ‘Flexi’ being driven by Pop Dwyer. The public is invited to attend the free exhibit opening on Friday, March 14 at 7 p.m. at the museum, where Buchan and his grandchildren will be on-hand to discuss their work. Included in the exhibit will be a very rare 1910 American Underslung automobile and a customized Buchan sculpture of the car and its owners. The Auburn Cord Duesenberg Automobile Museum houses more than 120 antique and special interest cars plus related exhibits on three floors. The museum is in the 1930s headquarters of the Auburn Automobile Company and is a National Historic Landmark. Group and family rates are available. The museum is open daily from 9 a.m.-5 p.m. year round. A 189-year-old tollhouse along the Lincoln Highway/US 30 west of Chambersburg, Pennsylvania, will be donated to the local historical society for offices and a museum. According to an article in the Chambersburg Public Opinion, the tollhouse is owned by the developer of a limestone quarry that has just won a 3-year battle to quarry 89 acres of surrounding land. St. Thomas township supervisors unanimously approved the general plan, and directed St. Thomas Development to the township planning commission, which will make a formal recommendation to the supervisors. The company plans to subdivide the land around the tollhouse and donate it the Franklin County Historical Society-Kittochtinny. Access and parking will have to be added. The small stone house just west of Campbells Run Rd was listed in the National Register of Historic Places in 1978. It served as was Tollhouse No. 2 on the Chambersburg & Bedford Turnpike (named for the its termini). Such turnpikes covered Pennsylvania in the early 1800s but fell into disrepair with the rise of canals and railroads. Bicycling, auto travel, and the Lincoln Highway revived them, though the LH worked to eliminate all tolls. Rehabbing the site also would add another tourist attraction to the 6-county Lincoln Highway Heritage Corridor. Remember those great gift shops and souvenir stands with all kinds of wacky stuff to buy? And how little (if anything) your parents let you get?? Well you’re grown up — you can stop now and stock up. BUT WAIT! Where’d they all go? Yes, very few survive, so when you do see one, it’s even more important you stop — to satisfy your souvenir craving and to help keep the place in business. Mister Ed’s is located at 6019 Chambersburg Road (between old and new Lincoln Highway routes) between Gettysburg and Chambersburg. It’s open daily 10 am – 5 pm, and admission is FREE. Try out this video — my first on YouTube! — taken in October with my still digital camera’s video option. 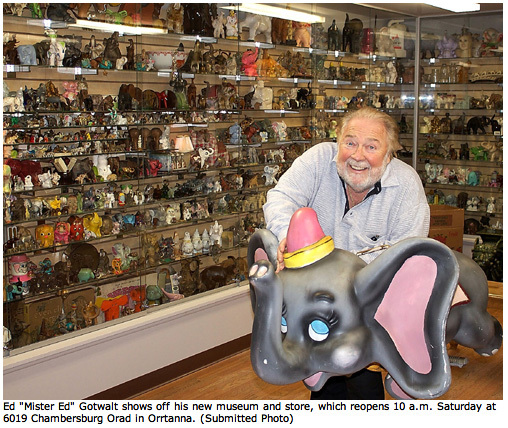 It’s only 20 seconds long but you’ll hear the fiberglass Miss Ellie Phant talk a bit about the place. Now then … should we buy candy or souvenirs? ?